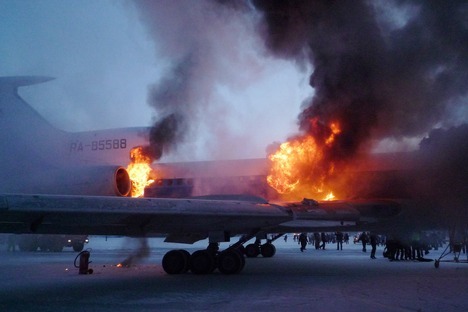 A crash in Siberia on New Year's Day that killed three people is only the latest tragedy involving Tupolev aircraft. Russia has grounded all TU-154B planes until investigators determine what caused a TU-154 to explode in Surgut on New Year’s Day. The passenger jet, which belonged to regional airline Kogalymavia was taking off for Moscow with 116 people on board, including members of the Russian pop group Na-Na, when it caught fire as it taxied down the runway. Three people were killed and 40 injured in the accident. The incident over the holiday weekend was just the latest to involve a TU-154; Aeroflot, Russia’s biggest carrier, removed all TU-154s from its fleet in 2010 after numerous technical failures. Emergency services spokesman Vadim Grebennikov said that the fire began in one of the plane’s three engines and caused a powerful blast that destroyed the aircraft. Television reports showed video footage taken with a cell phone of the burning plane, its center a giant fireball. All that remained afterward was the tail section and part of a wing. Grebennikov said 10 people were seriously injured, including six who were badly burned and four who suffered broken bones or other trauma. Most of the other injured passengers sought treatment for poisoning after inhaling toxic fumes. The airline will pay the families of those killed in the crash 2 million rubles ($66,000) in compensation, which is required under Russian law. Additionally, the local government has allocated more than 10 million rubles ($327,000) from its reserve fund for families of the killed and injured. “The families of the victims will each receive 1 million rubles ($33,000). The severely injured will receive up to 300,000 rubles ($9,800), depending on the severity of their injuries. The average payment to the injured is 100,000 rubles ($3,300),” stated a press release from the office of the governor of Khanty-Mansisyk, the Siberian region where the crash occurred. The Tu-154 has been the workhorse of the Soviet and post-Soviet civilian aviation industry since entering service in the 1970s. But after a series of crashes involving the aging fleet raised safety concerns, Aeroflot withdrew all of its Tu-154s from service, with the last flight a year ago. The midrange jet remains, however, the mainstay of smaller airlines across Russia and the former Soviet Union. It is banned from parts of Europe because of excessive engine noise. The plane carrying Polish President Lech Kaczynski that crashed in Russia last year was also a TU-154.